250 to 900 AD - The consumption of cocoa beans was restricted to the Mayan society’s elite, in the form of an unsweetened cocoa drink made from the ground beans. 600 AD - Mayans migrate into northern regions of South America establishing earliest known cocoa plantations in the Yucatan. 14th Century - The drink became popular among the Aztec upper classes who upsurped the cocoa beverage from the Mayans and were the first to tax the beans. The Aztecs called it “oxalate” meaning warm or bitter liquid. 1519 - Spanish explorer Hernando Cortez recorded the cocoa usage in the court of Emperor Montezuma. 1544 - Dominican friars took a delegation of Kekchi Mayan nobles to visit Prince Phillip of Spain. The Mayans brought gift jars of beaten cocoa, mixed and ready to drink. 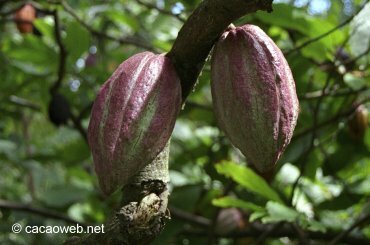 16th Century Europe - The Spanish began to add cane sugar and flavourings such as vanilla to their sweet cocoa beverages. 1570 - Cocoa gained popularity as a medicine and aphrodisiac. 1585 - First official shipments of cocoa beans began arriving in Seville from Vera Cruz, Mexico. 1657 - The first chocolate house was opened in London by a Frenchman. The shop was called the Coffee Mill and Tobacco Roll. Costing 10 to 15 shillings per pound, chocolate was considered a beverage for the elite class. 1674 - Eating solid chocolate was introduced in the form of chocolate rolls and cakes, served in chocolate emporiums. 1730 - Cocoa beans had dropped in price fro $3 per lb, to being within the financial reach of those other than the very wealthy. 1732 - French inventor, Monsieur Dubuission invented a table mill for grinding chocolate. 1795 - Dr. Joseph Fry of Bristol, England, employed a steam engine for grinding cocoa beans, an invention that led to the manufacture of chocolate on a large factory scale. 1828 - The invention of the cocoa press, by Conrad Van Houten, helped cut prices and improve the quality of chocolate by squeezing out some of the cocoa butter and giving the beverage a smoother consistency this process became known as “Dutching”. 1847 - Joseph Fry & Son discovered a way to mix some of the cocoa butter back into the “Dutched” chocolate, and added sugar, creating a paste that could be moulded. The result was the first modern chocolate bar. 1867 - John Cadbury mass-marketed the first boxes of chocolate candies. 1868 - The Swiss chocolate manufacturer, Daniel Peter, found a way of combining milk to the chocolate to create the first milk chocolate. The milk happened to be a concentrated infant formula Henri Nestle was working on. 1879 - Daniel Peter and Henri Nestle joined together to form the Nestle Company. 1879 - Rodolphe Lindt of Berne, Switzerland, produced a more smooth and creamy chocolate that melted on the tongue. He invented the “ conching” machine. To conch meant to heat and roll chocolate in order to refine it. 1913 - Swiss confiseur Jules Sechaud of Montreux introduced a machine process for manufacturing filled chocolates. 1926 - Belgian chocolatier, Joseph Draps starts the Godiva Company. Today we eat an average of just under 200g of chocolate per person per week. The confectionery industry is worth over £5 billion in the UK alone, of which chocolate makes up £3 billion!.